Nov 10, 2014 - Dalia Lemkus, 26, of Tekoa was stabbed to death at a bus stop near the entrance to Alon Shvut. At about 4:30 pm, a Palestinian terrorist aimed his minivan at a bus stop near the entrance to Alon Shvut. When his car struck a cement post placed to prevent such attacks, the terrorist stepped out of the car, stabbing and killing Dalia Lemkus, 26, of Tekoa. 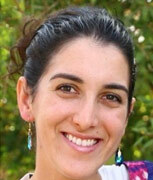 Dalia worked as an occupational therapist in kindergartens in Kiryat Gat and loved working with children. She also volunteered at the Tekoa branch of Yad Sarah (which loans of medical and rehabilitative equipment and other services for homebound and elderly). Dalia loved to bake cakes with her mother. She liked to help brides look beautiful by doing their makeup for them before their weddings. She was just getting started in life after finishing college - a kind, giving young woman looking forward to marriage and creating her own family. Dalia's family made aliyah to Israel from South Africa over 30 years ago and had lived in Tekoa for 15 years. She was the eldest of six siblings. She had previously been lightly wounded in another stabbing attack at the Gush Etzion junction in February 2006, at the age of 17. Dalia Lemkus was buried in Tekoa. She is survived by her parents, Nahum and Brenda, and five siblings.